My pair of jeans ripped while I was attending mass. I was relieved to learn that it ripped out of longevity being used rather than ripped cause of tightness or bulging thighs. 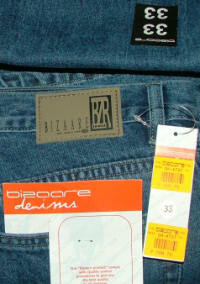 Since the Holiday season was filled with mall-wide sales, I decided to replace my newly retired jeans with a new pair. I went though the entire jeans section of Robinsons' Department Store but the ones I wanted didn't have my size. Feeling a bit sad that I couldn't find the pants I wanted, I figured I could check out the specialty shops. I tried Bizaare. I remember the last time I bought clothes from this brand was around 15 years ago. I used to like this brand back them and so I thought I'd give it a try. I saw a pair of jeans on sale for P299. and so I tried my size. I was shocked when it was loose. And so I did the unthinkable... and asked for one size smaller. Guess what... IT FITS ! I never tried nor attempted to wear jeans one size smaller for years simply because the size I've been wearing is just right (and there were times that my size was actually tight). And so, I'm so proud to wear these new pair of jeans knowing that it fits me. I think the 12lbs I lost is now showing in my clothes as well. I'm beginning to try clothes in my closet that I haven't worn for years cause they were getting smaller for me. And they all fit now. I think I'm on the road to getting slimmer. I didn't use to care much about my figure but since my body is changing, I might as well appreciate it and try to maintain it at the very least.